Plans to make electric vehicle charge points mandatory at motorway services and large petrol retailers have taken a step forwards along with developments in insurance for automated cars. Announced in the Queen’s Speech earlier this year, the Automated and Electric Vehicles Bill received its First Reading in the House of Commons yesterday (18 October) and according to Transport Minister John Hayes “will aid the construction of greater infrastructure to support the growing demand for automated and electric vehicles”. 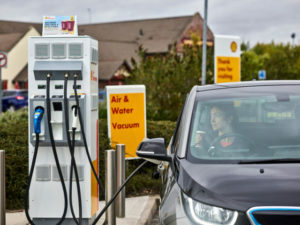 The news follows the announcement this week that Shell is opening a rapid charging service on its forecourts. The legislation on charge points is intended to drive take-up of electric vehicles and comes as the government pushes ahead with latest air quality plans as concerns continue to mount over UK air quality. As well as requiring the introduction of charge points, the Bill will also stipulate that all chargepoints will have to be ‘smart’, in order to help mitigate possible issues with grid demand. Steve Gooding, director of the RAC Foundation, welcomed the news, commenting: “It is clear that government needs to do more to accelerate the take-up of electric vehicles, tackling the issues that are currently persuading motorists to sick with conventional fuels. Roads Minister Jesse Norman will also announce further funding for local authorities at the Smarter Travel Conference in Milton Keynes on Thursday to fund install chargepoints in residential areas where cars are parked on the street. Earlier this week, MEPs voted for electric vehicle charging points to be a requirement in all new non-residential buildings. The new Bill will also enable drivers of automated cars to be insured on UK roads. This includes establishing the liability of insurers where an accident is caused by the automated vehicle itself, meaning that all victims of collisions involving an automated vehicle, including the driver if relevant, will have quick and easy access to compensation, in line with existing insurance practices. The announcement was welcomed by the Association of British Insurers (ABI), which the approach taken in the Bill will give the industry time to prepare for the commercial rollout of fully automated driving technology.